In general, a taller turf offers a better defense to pests and other stressors, while a closer cut turf is often considered more aesthetically pleasing. Determining the best height of cut (HOC) requires balancing the stress response to mowing with golfer expectations of playability, staffing levels for mowing frequency, and budget considerations for the increased maintenance and inputs of lower HOCs. Especially at low turf heights (<1.5 inches), the corresponding reduction in root strength requires more intensive maintenance (e.g., water and fertilizers) to maintain turf density. * For intermediate, primary, and secondary roughs. Intermediate rough cuts are defined as a narrow (<10 feet) step-up cut immediately adjacent to the fairway. HOC for intermediate roughs is usually in the lower part of the specified ranges, typically 1.0 – 1.75 inches. 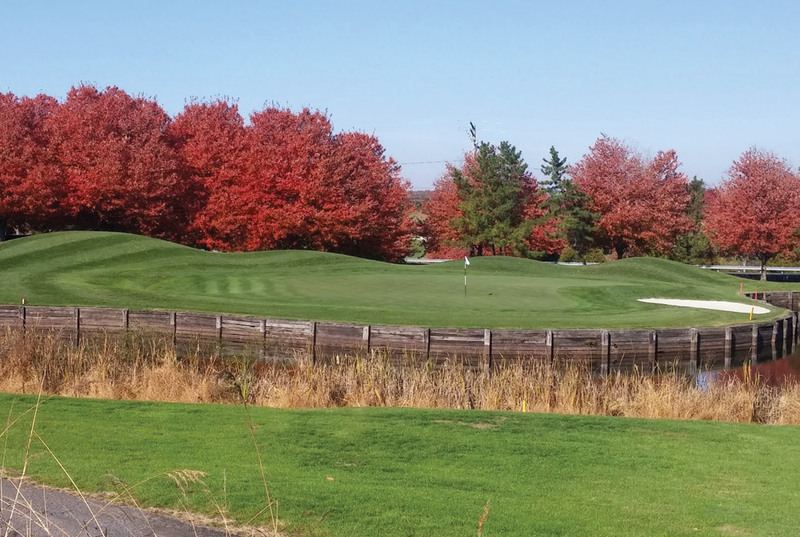 Mowing height can also be varied seasonally to improve turf responses to changes in weather and available sunlight such as during spring greenup, summer stress tolerance, and cold hardening. For example, in the early spring warm season, grasses have a more prostrate growth habit and can be mowed closer without negatively affecting overall plant health. At this time of year, close mowing can control thatch, increase turf density, remove dead leaf tissue, and promote earlier greenup. In the summer, by contrast, a higher cut helps moderate stress through a variety of means such as insulating the crown from heat stress, reducing weed completion, and reducing water needs. In shaded areas, shoots elongate to capture sunlight, resulting in a weakened root system. Therefore, the HOC should be raised to increase photosynthetic area and improve carbohydrate availability. Mowing stress can also be reduced by minimizing turning in these areas. In addition, a plant growth regulator (PGR) can be used as a regular management tool to control growth in shaded environments. Tall grass should be mowed frequently and height gradually decreased until desired HOC is achieved. In shaded environments, HOC should be increased by at least 30% to improve the health of turf. Consider using a PGR as a regular management tool to improve overall turf health for grasses growing in shaded environments. Increase HOC during times of stress (such as drought), as much as use will allow, to increase photosynthetic capacity and rooting depth of plants.